Formula One racing fans will savor an Asian dinner feast tonight when, at 8 p.m., the first-ever F1 night race blasts off: the Singapore Grand Prix. Here in Cebu, one young man, only 14, will keenly watch the turns, twists and traction. A big fan of Ferrari and Felipe Massa, he’ll cheer at home together with dad, Paul; mom, Cyndy; and brother, Paolo. But while he’s watching, his mind will linger at the thought of a nearby city: Suzuka, Japan. Paco Catane Rodriguez, one of go-kart racing’s most celebrated stars in Cebu—and, yes, in the entire country—will leave on Tuesday for the World Karting Finals in the world’s second largest economy. You see, last July, the motorcycle giant Yamaha sponsored to send a Cebuano to the World Finals in Japan. After four legs of the KT 100 division—he won all four—one teenager with the initials “P.R.” emerged victorious. Paco’s racing career started 10 years ago—when he was only four years old. His dad, Paul, a well-known Cebuano businessman who owns, among many ventures, Auto Prominence Corp. (distributor of Audi and Volkswagen cars), gifted his youngest son a 50cc PW motorbike as birthday present. Since his first try at revving the engine and feeling the rush of wind blow against his face, Paco has been smitten. Two years after that motorbike try, he visited Kartzone in Mabolo. With the urging of his older brother, Paolo, who, by that time, already raced go-karts, he stepped inside a go-kart, pushed the pedal and zoomed ahead. “After my Fun Kart Testing,” said Paco, “I told my dad that I really wanted to race.” Encouraged by his son’s interest, the supportive father bought Paco his own go-kart. He was only six! After that, it’s been victory after triumph after victory for the young Rodriguez, who’s now a third-year high school student at Sacred Heart School-Jesuit. 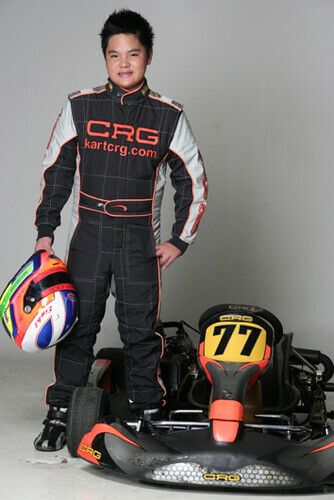 His first big win came in 2001 when he was runner-up in the Shell Karting Series Cadet 60. The year after, he won as overall champion in the Y101 Karting Series Cadet 60—his first-ever major win. Paco was only, believe this or not, only eight years old. What followed next were a series of wins that sped faster than his 150-kph go-kart top-speed: the 2003 Tuason Cup champion and the 2003 overall National champion in the WG&A Series Cadet 85. Then, in September of 2005, Paco emerged as the National Champion in the F125 Novice—becoming the world’s youngest (at 11) to win the division. Here’s more: in 2006, he was the champion in the Shell Karting Series Junior ROK Cup and, that same year, emerged as the RP Junior Karter of the Year—not just in Cebu, but the entire nation. Last year, he not only won as overall champion in the Southern Philippines Karting Jr. ROK but he was also able to represent our country to the World Finals in Lonato, Italy. Having competed many times in Macau and in Malaysia, attending a race in Italy was an unforgettable experience for Paco. “We raced in the ROK division (Italian-made engine) and most of the world’s best go-kart racers were there. It was a trip I’ll always remember,” he said. I asked Paco about his trip to Japan where he’ll travel with his family and spend a few days practicing at the Biwako Motorsport Land track before the Oct. 4 and 5 event. From Cebu, we wish you the best.